Imogen Wood specialises in the study of archaeological ceramics, from the initial recording of a sherd in the ground, to the detailed petrographic analysis of its physical and social provenance towards unravelling its meaningful role in past societies. 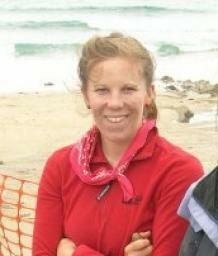 Prior to her BA in Archaeology at Durham University she worked in the commercial archaeology sector for 6 years. Imogen went on to do an AHRC funded MA and PhD at the University of Exeter, followed by an IfA funded workplace learning bursary in the geology and petrology of the South West in relation to ceramic petrography with Dr. Roger Taylor. She now works as an independent ceramic specialist and petrological analyst in the South West in both the commercial and academic research sectors. She is involved with the teaching of ceramic materials, the analysis of pottery from the Ipplepen excavation as well as directing students on her on-going collaborative National Trust RDPE funded excavation at Gunwalloe in Cornwall. She specialises in the pottery of the South West and has over 10 years of experience covering many periods from Prehistory up until the Norman Conquest. Imogen’s doctoral thesis investigated the shift in clay-sourcing strategies and production during the transition from Romano-British to early medieval communities in Cornwall using petrographic analysis and ethnographic analogy. The results highlighted the interconnectivity of socialised people, raw materials and the networks inherent to any society. A single source of clay – the Gabbro – was utilised in the production of pottery in Cornwall for 6000 years, and became a node in the socialised landscape, linking people with a place where the origin of traditions and kinship were physically expressed and open to personal experience. The inclusion of gabbroic clay in ceramics over time became a socially significant performance integral to the maintenance of society and regional identities; consequently its decline in the early medieval period signified a fragmentation of kinship network and regional identities, providing a unique indicator of social change for this period. The Gunwalloe excavation has involved Exeter undergraduate students and members of the local community over the last three years. It is funded by the National Trust’s ‘Unlocking our coastal heritage project’ which aims to investigate and record archaeological sites at risk of coastal erosion in Devon and Cornwall. The section of coastline investigated at Gunwalloe has revealed a Bronze Age promontory settlement and Cist burial, an Iron Age promontory fort with a later post-roman defended phase, an early medieval settlement in the sand dunes 9th-11th century AD and evidence of a 13th century ecclesiastical community. The project has applied a wide range of environmental analysis, such a phytolith analysis carried out by a palaeobotany research student Jenny Wattling and soil micromorphology analysis by Dr. Ben Pears. Collaborative work with Reading University research student Tom Walker contributed mollusc analysis.